#1 PETE or PET (Polyethylene Terephthalate): Used for clear beverage bottles. Widely recyclable, check with your local recycler. #2 HDPE (High-Density Polyethylene) : Used for colored bottles and jugs, yogurt containers and other tubs. 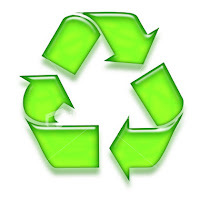 Widely recyclable, check with your local recycler. #3 PVC (Polyvinyl Chloride): Used in some cling wrap and bottles as well as pipes and other construction materials. Not widely recyclable. #4 LDPE (Low-Density Polyethylene): used for garbage bags, food storage bags, some cling wraps and bottles. Not widely recyclable. #5 PP (Polypropylene): Used in butter tubs, baby bottles and other rigid containers. Not widely recyclable. #6 PS (Polystryene): Used in foam trays, takeout containers, coolers and egg cartons (also those little black plates you see at banquets). Not widely recyclable. Recommended to avoid. #7 Other (includes polycarbonate and mixed materials). This is a tough one. While some things in this category are not widely recyclable, biodegradable and compostable containers are often lumped into this "other" category. When you see #7, ask more questions. As an example in my area, #1 and #2 plastic can recycle curbside, all others except #6 can be taken to a local recycling center. And #6, well good luck finding anyplace to take it unless you happen to have a freight car full of it. So I keep this in mind when making my purchases. I know, I know...this information doesn't even take into account the scary chemicals that can leach out (that is a whole discussion to itself).